The Gurkha Everest Expedition 2017 was the culmination of a five-year journey for the Brigade of Gurkhas. 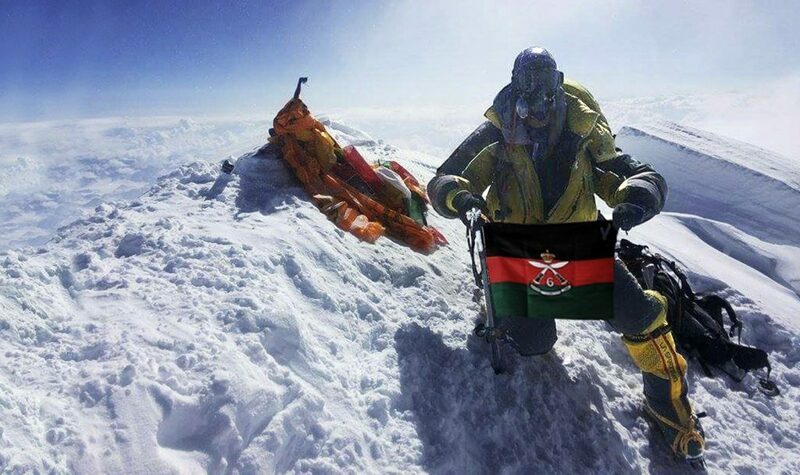 On 15 and 16 of May 2017, 13 members of the Brigade stood on the summit of Mount Everest, the first serving Gurkhas ever to do so. In turn, it is also the most successful mountaineering expedition on Everest in some time, having fixed ropes to the summit for the first time by non-Sherpas, achieved a 100% summit success from the summit team and returned all members without any serious injuries. It is also the start of something bigger and more enduring; the Gurkha Exploration and Mountaineering Society (GEMS) will be launched shortly, providing more opportunities for Adventurous Training to members of the Brigade and more remarkable achievements by Gurkha soldiers. I was in Khandbari drinking tongba (in the middle of the day, I admit) when the first earthquake hit in April 2015, certainly nowhere near the dramas experienced by the Everest team who were at Camp 1 (6,000 m) at the time. Their tale has been well publicised and is an extraordinary one, but better told elsewhere (see The Journal No. 96). The first interaction I had with the team was some weeks later in Kathmandu, when I had the pleasure of meeting a group of shaken, but robust, mountaineers who had a story to tell and a mission to finish. So, after some good fortune and a few training events in Scotland I made it to the start line of the 2017 expedition in a supporting role along with another Lieutenant from 2 RGR, Liam Smith. Both of us had a good deal of climbing experience, but Himalayan peaks were a completely new endeavour for both of us. We approached the expedition with an open mind as to summit ambitions, and focused on supporting the team goal of getting a serving Gurkha soldier to the summit of Mount Everest. It was, through and through, a truly memorable experience, partly due to the climbing but mostly due to the team. Our trek into Base Camp, a 14-day journey through the best of the Khumbu valley, was a real pleasure despite the occasional bouts of headaches from the altitude. Inevitably, the younger soldiers would race off ahead in the morning, and several times through the day we would come to a small crowd of locals surrounding our Gurkha climbers spinning tales or playing songs. We were, certainly, a team that differed from the usual fare that is seen trying to scale Everest as part of commercial expeditions. We had a warm relationship with our Sherpas and created a genuine atmosphere of trust extremely quickly. Our initial acclimatisation rotation through the mountain, from Base Camp (5,300 m) to Camp 3 (7,200 m) gave us significant confidence. Most teams are lucky to get to Camp 2 (6,300 m) on their first journey, whereas we were able to return to base camp knowing that we had achieved enough altitude to push to the summit on the next go if required. The team moved quickly and efficiently through the Khumbu icefall, and was making impressive progress higher up the mountain relative to other outfits – we clearly had an edge. At Camp 2 we were able to relax, enjoy the spectacle of being in one of the most amazing locations in the world and look forward to what was to come on our second rotation. To be sure, with Everest towering above us and the summit clearly being battered by high winds, every individual also had their own chance to reflect on what was to come and their part in it. If we were in any doubt as to the seriousness of the climb, we passed the body of a famous climber, Ueli Steck, the next morning as we descended from Camp 2 to Base Camp. He had fallen some way that morning from the Nuptse wall. Helping with the recovery, we saw first hand what fine margins we operated within, a sobering part of the expedition for all. This was a theme which persisted. On our summit rotation, the first body we encountered was just a few metres from our tent at Camp 4 (8,000 m), and several others higher up. I believe that we were well prepared for this mentally not only by virtue of our kaida, military training and experience, but our attitude to the climb; bring success, but not at any cost. All of us were prepared to sacrifice our summit attempt to assist another climber if required. Our summit bid was the product of detailed planning and a bold attitude. It was the first attempt on the summit from the South side that year, and saw an advance team of three Gurkhas with their Sherpas climbing on the 15 May in the same style Hillary did in 1953, followed by a main team of 10 the next day who were to climb using ropes fixed in place by the three leaders. It placed 13 of the team in a narrow weather window, entirely reliant on the ability and professionalism of the three Gurkhas in the advance team. If they were unsuccessful, it could have turned out very differently. With accurate and timely weather updates from our Base Camp team, we were confident that this was the right move. Our boldness paid off. All 13 of those given the opportunity to summit were successful, and moved up and down to the summit in some style and speed. Other teams, who had followed our lead and tried to get a head start from Camp 4, were quickly overtaken. We soon made rapid progress to the summit and most of us enjoyed a clean, crowd free alpine ascent to the summit. I was in the main team of 10, and reached the summit just after 7am on the 16th. I spent 10 minutes on the summit, for five of which I simply sat and took in the view – advice given to me by a previous summiteer and certainly worth the cold. At the summit, the 6 GR flag was proudly unfurled on my ice axe, a flag we had carried up from Kathmandu since being presented it at British Gurkhas Nepal. Unfortunately the wind has caught the flag in the picture, so only the ‘Q’ of Queen’s and the crossed kukris are on display – I can only apologise, but cannot promise a reshow! I can, however, promise that there will be further exploits through the Gurkha Exploration and Mountaineering Society, and we look forward to sharing those with you in the future. We are extremely grateful for the support from the entire Brigade family, and 6 GR in particular, for making this opportunity happen. We are hugely proud that an officer from RGR, our successor regiment, should have carried the 6 GR flag to the summit on 16 May 2018, exactly 200 years after the day the Regiment was raised. We could not have asked for any better birthday present. (I have to admit that subsequent ‘magic’ seems to have unfurled the flag in the photo on the summit; some things have to be done for posterity!) 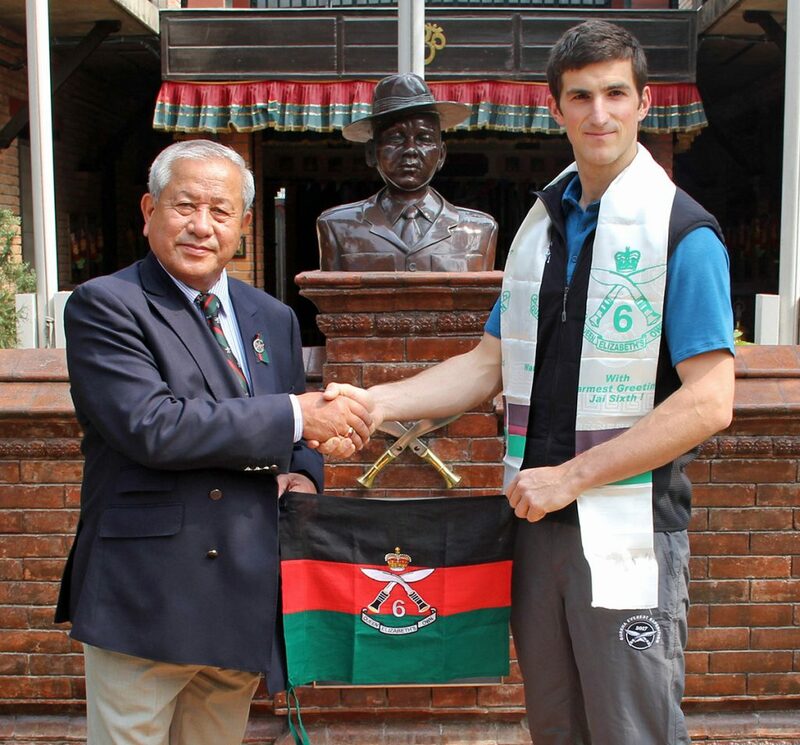 Our Trust contributed towards the expedition by giving £4,000 in local currency to the Expedition’s climbing leader Major Andrew Todd RGR when he passed through Kathmandu. We congratulate every member of the Gurkha Everest Team team and those who supported them for their outstanding achievement. In particular, we thank Chris Boote for his personal efforts in getting himself and our flag to the summit, for returning the flag to us at our Kempton Park 200th Durbar and for writing this article.